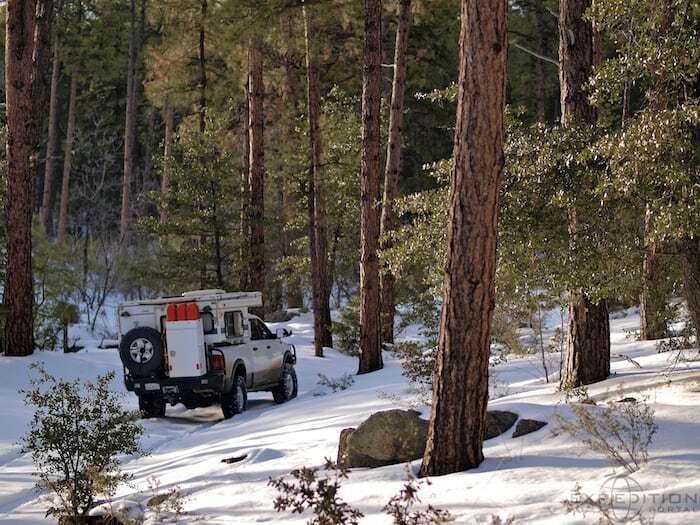 Each winter the team at Overland Journal and Expeditions West schedules a snow day on the trail. This ultimately becomes a “stuck fest”, which is kind of the point. The great benefit of driving in the snow is that is keeps our slick surface driving skills sharp while doing no damage to the trails. 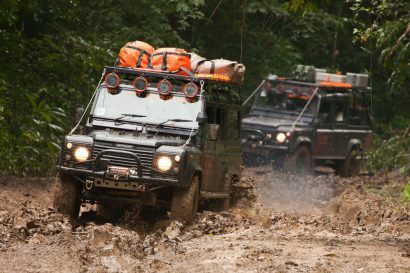 It also allows us to do a bunch of winching and testing new recovery gear. This year was no exception and we brought along the new version of the MaxTrax for some abuse. A day in the snow from Expeditions West on Vimeo. On the trip we had Ray and Brian, both driving the Overland Jeep JK. This truck has been well used and continues to perform without protest. We also had Barry, a good friend and exceptional photographer. Some of you will recognize his work from the Latitude section of Overland Journal. Barry drives an awesome 2010 Dodge Power Wagon with full Carli race suspension, Aluminess bumpers and custom Fourwheel Camper. Look for a more detailed article on this truck soon. Also on the adventure was Austin, a local Prescott College student and fun guy to have around. Austin has started to do a few projects at the office and drives a Nissan XTerra with a few modifications. He fitted 265/70 R17 BFGoodrich All Terrains and a rear ARB locking differential. As we gained elevation, the snow got deeper and the slope added to the challenge. There was one cross-axle obstacle that proved particularly difficult for the Xterra. This was because of the limited articulation and lack of front locking differential (or traction control). It eventually took four Maxtraxs to get the Nissan through. 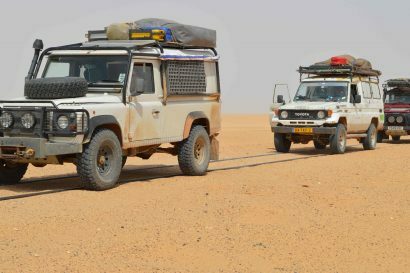 It was an important lesson though, as the vehicle did not have a winch and was properly aired down. The MaxTrax really did work. We also used this cool Ryobi chainsaw. It uses a Lithium battery back and is super light. No oil or fuel to spill – it was surprisingly effective. The Power Wagon cut some serious ruts. It was impressive, especially given that it could be lived out of for years at a time. Barry has designed a unique vehicle to be sure. A fun day in the snow! Twisted Throttle equpped F800GS and Chris "Teach" Mcneil!